Ranging through art galleries and exhibitions via craft studios, the creative talent in the Lakes is unrivalled. Happily, art galleries are well-represented and have given many artists the chance to live and work in the Lakes. Some of them rival the bets galleries to be found anywhere. The fascinating 3V Gallery in Grasmere (adjacent to Dove Cottage) is one of these, with a fascinating exhibition connecting the visual arts to poetry and prose. If you're in Keswick, a must-see is Gallery 26 at 27, who are specialists in contemporary art - and a visit to Thornthwaite Galleries is always worthwhile. For a sculpture exhibition with a difference, explore the innovative High Head Sculpture Valley at Ivegill or - for a real treat and a great day out - try the amazing sculpture trail in Grizedale Forest (with over 75 sculptures!). There are plenty of places to buy works of art and high quality crafts. For example, Gallery H in Arnside boasts a collection of contemporary art and traditional crafts, works of fine ort and interior decorative objects. There are some amazing contemporary jewellery pieces at the Necessary Angel in Keswick. For superb designer handmade furniture visit the ever-reliable Hall & Sons of Staveley. Many craft workshops and artists are tucked away around the county. For example, call in at the Heaton Cooper Studio in Grasmere, who have a massive collection of art materials. There are many wonderful events and festivals which celebrate the wealth of artistic and creative talents in the Lake District. Ulverston has its Flag Fortnight, Print Fest and the ever-popular Lantern Procession. And for art lovers, Grange-over-Sands has an open-air prom festival, while Penrith has an amusing annual Potfest. And for our final selection, why not visit the annual Cumbrian Artists' Open Exhibition, which is held at the Upfront Gallery, located near Hutton-in-the-Forest? There's a wealth of local talent in the field of Lake District crafts, including skilled blacksmiths, wood turners, jewellery makers, toy makers, textile artists, artisan food producers, and more. See the map below and then select the number corresponding to the place you'd like to see. At the bottom of the page there's a list of places you can buy "Made in Cumbria" crafts. A busy country pottery selling earthenware and stoneware pots mode in the pottery. Also pots by other potters. Pottery courses, pottery painting and pottery lessons - phone for details. Large range of garden pots. Mail order available. Directions: North end of village 200 yards from centre, towards Whitehaven. Domestic thrown stoneware. Finished in cream/green, cream/blue slip slip brushed decoration. High fired oven to tableware. Hours: Eight till late 7 days. Closed Christmas and New Year. Directions: In Kirkby Stephen, turn towards Crosby Garret / Appleby off the A685. In Soulby follow brown tourist pottery signs. I now have a gallery shop which is open to the public. 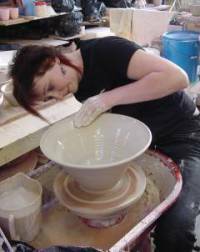 I also share the workshop with two other local potters, Arwyn Jones and Gwen Bainbridge. Brougham Hall is a fortified 14th Century house which is in the process of being restored and I occupy the old stables. There are other businesses on site as well as a lovely cafe. Hope to see you soon. style glazes fired in a gas kiln. Directions: Follow the signs to Holme Mills Industrial Estate from the A6070. Ceramics inspired by the Pennine landscape are on display in this unique 17th century building. Changing exhibitions by other ceramic artists are held throughout the year. 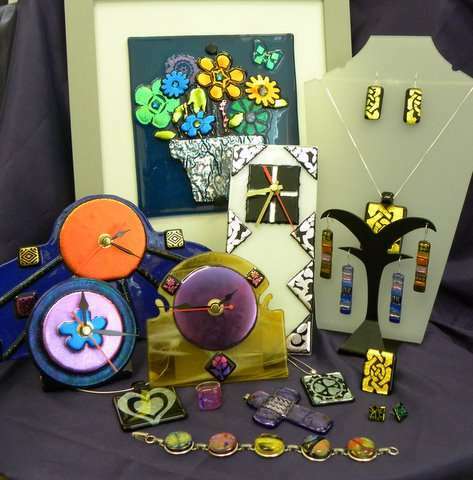 Deborah makes unique jewellery to her own designs, and her work can be seen in a number of Cumbrian galleries. Her latest range is of fused dichroic glass jewellery. 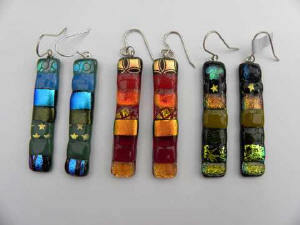 Her pieces vibrate with all the colours of the rainbow, producing stunning effects - the colours shift as if they were permanently under water. And now - Deborah also now makes pictures, clocks, photograph frames and other items, also all of dichroic glass. all well worth a look, and very likely to solve your present problems! Click to expand the photos below. In Sue's specialist gem shop you can choose from an array of semi-precious jewellery. Alternatively have a piece created for yourself from her large stock of beads and stones. Directions: Within town centre at southern edge near Post Office. The Cumbrian landscape has changed throughout the ages and part of that change has been the gradual clearance of woodlands. However woods such as those at Grizedale, near Coniston, remind us of how important they were to the Cumbrian economy. Some woodland skills still remain in a small way, such as coppicing and charcoal burning, whilst industries such as bobbin making have died out. However it is the skilled craft workers and small enterprises working in wood who are still prominent in the county. These include swill and basket makers, toy and walking stick makers, wood turners and carvers, and of course furniture makers working in both traditional and contemporary styles. Stokoe House, Market Place, Alston, CA9 3HS, 01434 382973 featuring locally made and tratitional arts & crafts. Harold Harrison is a professional turner on the register of The Worshipful Company of Turners of London. He offers patient, personal tuition for beginners and beyond in his modern, purpose built turning school. 1 - 3 day courses available. Lunch and refreshments provided. Directions: Students are met at M6 Southwaite Services North or South. Handmade furniture in local hard woods, wood-carving, painted woodwork and the "House-box" - your home in miniature! Richard and Mary work to commission, with consultations and quotations free. Directions: Half-way between Smithfield and Hethersgill. Repairs, seating, craft supplies, tuition. Cane, rush, cords, seagrass, willow and rope. Hours: Usually Monday to Saturday 9.30am - 5.30pm, Sunday by appointment. Directions: M6 junction 37 onto A684. Handmade kitchens & bedrooms. Summerhouses & gazebos. Home offices. Garden architecture. Oak framed wooden garages. Nationwide delivery. Hours: Man to Fri 8am-5pm, Sat 8am-12pm. Other times by arrangement. Directions: J42, M6 Head for Dalston. First right to Brisco. Half a mile through village. This is a high quality wooden toy making business, established in Lazonby's original school. The shop sells exclusively locally made toys with an ever expanding range for young and old, from little spinning tops to wooden animals to sophisticated sculpture sets. Hours: Easter and June to Mid December, Wednesday to Friday 10am - 4pm. Normally open all year and all week, current times are on the answerphone. Directions: On the B6413, 100 yards up from the Lazonby shops. Cumbria has a rich textile history particularly in the wool trade. As well as the woollen mills dotted around the valleys and dales, the county had a strong reputation for its hand knitting which involved all the family and whole communities. The most famous were the "terrible knitters" of Dent in the 18th century who were known as terrible for being terribly good! The Cumbrian hills are also home to three native breeds of fell sheep, the Herdwick, Rough Fell and Swaledale, while our long history in the wool trade is further recognised through having our own distinctive colour used for dyeing cloth - Kendal Green. This vibrant history is still alive, with Cumbria still home to many of the country's most creative textile makers of knitwear, clothing, weaving, felt and textile art. Unique wildlife designs hand printed on roller blinds, table linen, fleeces, ceramic tiles, etc. Also a selection of pine furniture, pottery and limited edition prints by local artists. 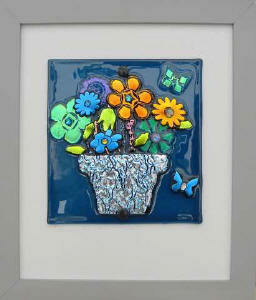 Also features a range of gifts only available from our workshops! Hours: Monday to Friday 9.30am-5pm, Saturday 10am-4pm. Directions: From the village follow the signs for "Gondola" towards the lake. Established in 1985, Farfield Clothing manufacture a wide range of colourful and warm clothing for the whole family. Situated in the centre of Sedbergh in a beautifully renovated old Primary School just off the Main Street, you can browse in the Factory Shop. Directions: M6 J37, turn left off the Main Street. Locally designed and printed Lake District and Coast to Coast T-shirts are available at Rannerdale Mill Shop in Cockermouth's Market Place, along with hand-made children's fleece jackets and hats, lambswool and Shetland wool knitwear applique sweatshirts & embroidered cardigans, white bowls wear and water-repellent golf sweaters. Directions: Just across the Cocker Bridge, opposite Percy House Gallery. A co-operative of farming/craftswomen pooling skills in spinning, dyeing, knitting and weaving to produce a wide range of high quality, innovative and colourful items using wool from local sheep. Rugs, sheepskins, jumpers, yarns, felt, fleece - all in natural colours and dyed. Hours: 11am - 4pm, Tuesday - Sunday and Bank Holiday Mondays. Closed New Year mid February. Directions: Next to the church in the centre of the village. Visitors to Betty Fold may browse at leisure viewing unique photographic images by Neil Salisbury of Lakeland fell hunting, and stunning scenery. Sample delightful home-made soups and baking while you enjoy the ambience of this beautifully situated country house. Directions: From Ambleside to Hawkshead road, follow signs for Tarn Hows. The Gallery: An exhibition of paintings, prints, sculpture, and cards of the work of four generations of the eminent Heaton Cooper family, from the watercolours of Alfred 1863 - 1929 and William 1903 - 1995 to the present day members. Artist Materials: An unusual range of specialist painting and drawing materials together with an exceptional range of papers. Hours: Easter to October, Monday to Saturday 9am - 5.30pm, Sunday 12pm - 5.30pm; November to Easter, Monday to Saturday 9am - 5pm, Sunday 12pm - 5pm. Directions: Centre of the village, opposite the green. HavenArt artist's studios create panoramic photographs of your special places in Cumbria. These can be customised with your words, or a photomontage created from your holiday photos. See website for details - posted worldwide. Canvas painting, screen printing and collographs are also created in this Georgian house. Directions: Hidden just off the A595 at Whitehaven. Brysons Craft Bakery and Tea Room, which started over 50 years ago on the same Keswick site, still produces a dazzling array of top quality freshly baked goods for its shop and Tea Room. Lakeland Plum Bread is a must for all visitors to the area. Directions: Situated in the centre of Keswick on the main street. A real home from home in a fantastic setting, The Bridge Cafe & Bistro offers something for everyone from the famous Bridge Breakfast to homemade Indian & Thai delicacies to our outstanding evening meals. A place where food matters! Hours: Sun-Thurs 8am - 8pm, Fri - Sat 8am - 11pm. Directions: Situated on the A590 at Newby Bridge. Situated on the A590, just south of Newby Bridge. Use postcode LA12 8ND in your SatNav. Delicious ice-cream made here on the farm, using milk and cream from the resident herd of Ayrshire cows. Relax in the quaint ice-cream parlour, or browse in the gallery, featuring photography by Louise Kyle, locally made crafts, gifts and much more. Hours: Open 7 days, 10am 5.30pm, Easter to November. Varies out of season. Directions: Find us in Buttermere Village, just below the church. An award winning, family run business with a range of top quality home made relishes, chutneys, mustards, sauces and preserves. All are available through the shop and mail order. Hours: Open daily 9.30am - 5pm. Directions: Located on a corner of the main village square. Kennedys Fine Chocolates are handmade using the finest chocolate and ingredients. Visit our Factory Shop and Coffee House with viewing windows into the production area. Delicious home baking and homemade ice creams. Mail order service available. Chocoholics welcome! Hours: Monday to Saturday 9am - 5pm, Sundays and Public Holidays 11am - 5 pm. Directions: 2 miles from M6 Junction 38 on B6260, 4 miles M6 Junction 39. This unique little shop, built in 1630 as the village school, is the only place to buy the genuine Sarah Nelson's Original Celebrated Grasmere Gingerbread. World famous for its secret recipe and freshly baked everyday since 1854. Worldwide mail order available. Hours: Monday to Saturday, 9.15am-5.30pm, Sunday 12.30pm - 5.30prn. Closed Good Friday, Christmas Day, Boxing Day. Shorter hours in winter. Directions: Centre of village, between Wordsworth Hotel and the churchyard lychgate. Ambleside Artists' Courtyard, comprising Novel Cafe Book and Coffee Shop, Studio Pottery, Caribou Arts and Contemporary Crafts, is run independently by the artists and makers. They specialise in ceramics, paintings, jewellery and textiles. Directions: Down the courtyard between Youngs Furniture and Homes of Football. Award winning farm attraction including a large 1760 stone barn, full to bursting with high quality crafts and art made by hand in Cumbria, with regularly changing exhibitions in the gallery. Also visit the popular tearoom and children's farm animal park and playground. Directions: From B5300, Silloth to Maryport Coast Road, turn for Newtown between Beckfoot & Mawbray, follow the signs. A fascinating gallery showing a wide range of painting, prints and craft work. Monthly exhibitions by emerging and established artists and craftspeople. Gifts for sale from Cumbria and surrounding counties. Also houses the Egremont Tourist Information Centre. Hours: January-February, Monday to Friday 10am- 1pm; March-December, Monday, Tuesday & Thursday to Saturday 10am-5pm; Wednesday, 10am- 1pm. Contemporary Art and Design in Cockermouth's oldest town house, dated 1598. Exhibitions ranging from textiles to photographs, paintings and sculpture. Unique furniture, ceramics, jewellery, glass, metalwork and textiles. Hours: Monday to Saturday 10am - 5pm, all year. Directions: 2 minutes walk along main street, just over the River Cocker 2 minutes from public car park. Based in the old station yard in Plumpton, the Pot Place sells garden pots and ornaments, water features, log cabins, children's play equipment & gifts. There's a tea room serving home made cakes and snacks. Hours: Open daily 10am - 4pm throughout the year. Directions: Junction 41 of the M6 or A6, 5 miles north of Penrith. The gallery of etcher, watercolourist and pastel artist Rolf Parker, also stocks a fascinating range of high quality British crafts including ceramics, pewter, glass and handmade cards, plus a large selection of fashion jewellery made on the premises. Hours: Tuesday to Saturday 1 0am - 5pm closed between Christmas and New Year. Directions: Just off Station Street, near to the Tithe Barn Pub. Where to buy "Made in Cumbria" crafts. 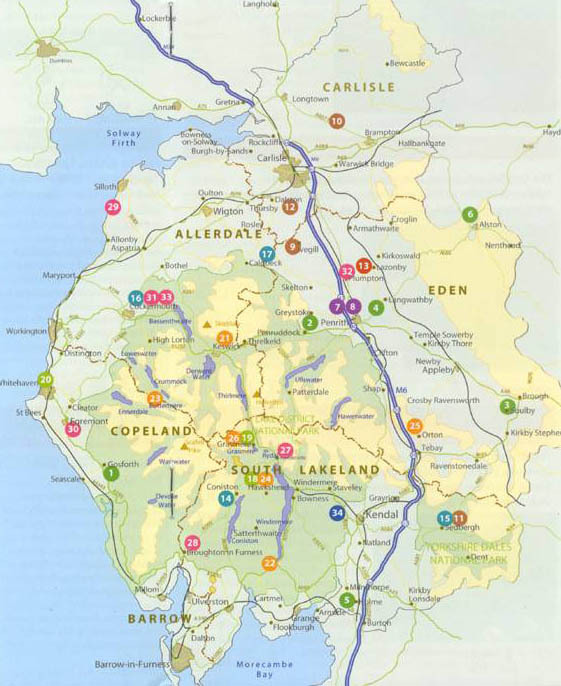 Throughout the county, Made in Cumbria has a network of over 25 Partnership Shops. These partnerships are an important part of the development of our craft and gift sector. Creating a "shop within a shop" allows the craftspeople to find a market for their products through these many varied outlets. Wide selection of Made in Cumbria items, ranging from pottery to candies and textiles. Also a stunning range of Pilula Crystal and Pearl jewellery. Don't miss this little gem of a shop. Hours: 9.30am-3.30pm Oct-Mar, 9am-5pm Easter-Oct, closed Fridays until Easter. Directions: Situated on Waterhead Pier behind the Windermere Lake Cruises ticket office. A combination of post office and gift shop, where you will find Made in Cumbria jewellery, ceramics and pottery. Don't forget to sample our delicious Coniston Fudge, which is made on the premises. Hours: April - Oct 9am-5.30pm 7 days per week. Winter openings will vary. Magnificent life-size sculptures are imaginatively displayed in a natural wooded valley. This unique attraction also features a gallery and ever changing exhibitions. Freshly prepared Cumbrian food in the traditional farmhouse tearoom. A selection of Made in Cumbria gifts and art are available in the gift shop. Directions: M6 J41 take B3053 to Hutton in the Forest. From north M6 J42 towards Daiston. Turn left at Black Lion pub and follow brown signs. Visit Cumbria's gateway service station to see a selected range of Made in Cumbria gifts featuring jewellery, figurines, and Lakeland mementos from around the county. Hours: Mon - Sun 7am to 11 pm. Make a visit on the way to North Cumbria and Hadrian's Wall to see a selected range of popular Cumbrian gifts and craft in the gift shop. The featured items include figurines, glass, interior items and mementos of the area. wood, jewellery, toys, pictures and prints. Hours: 10am - 6pm. Directions: M6 J46 Penrith on A66 and follow signs to Keswick. The Sellafield Visitors Centre presents a unique educational experience and contains interesting and innovative exhibitions providing an insight into the world of BNFL and Sellafield. Made in Cumbria has a large range of items available in the site gift shop. Directions: 11 miles south of the coastal town of Whitehaven in West Cumbria. A mix of local crafts, garden gifts and regional foods, Bridge House Farm is a year-round destination for a good quality afternoon out! Plants and Horticultural Expertise. Picnic Area and Children's Playground. Riverside and Woodland Walks. Hours: Open 6 days a week, Tues-Sun 10am-5pm. Directions: M6 J34 East onto A683, after about 5 miles turn right towards Wray.